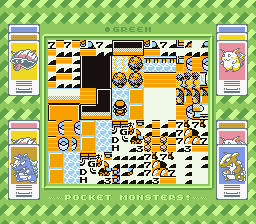 SGB Pocket Monsters: Green (JPN v1.0) "warp glitch" in 04:24.37 by p4wn3r. This game (along with Pocket Monsters: Red) is the Japanese version of the first generation of Pokémon games and the first ever Pokémon game. This run, a ten frame improvement over the previous version, abuses a glitch that was fixed in later releases of Pocket Monsters (Pokémon) that allows a player to warp freely through the world. Victory is achieved in a matter of minutes with this route. Normally, the game takes well over an hour at the fastest to finish. To see a more substantial run of the first generation of Pokémon, watch this movie. For a less substantial run (which also demonstrates that they didn't fix all the glitches in later versions), watch this one. Note: This movie requires VBA rerecording v20, as it does not sync on any other version.